Duplicate Sweeper is designed to make finding, selecting and removing duplicate files on your computer quick, and easy. Using our advanced search algorithm, you can quickly identify files with the same content, even if they are named differently, and you can then easily navigate through the identified files, and either manually select the files to remove, or choose the file to keep based on the date created. Duplicate Sweeper will then place the selected files in your Recycle Bin, allowing you to retrieve them should you change your mind. You can also save your duplicate search results for later usage and load your previous duplicate searches for your convenience. These help pages will guide you through using Duplicate Sweeper's features. 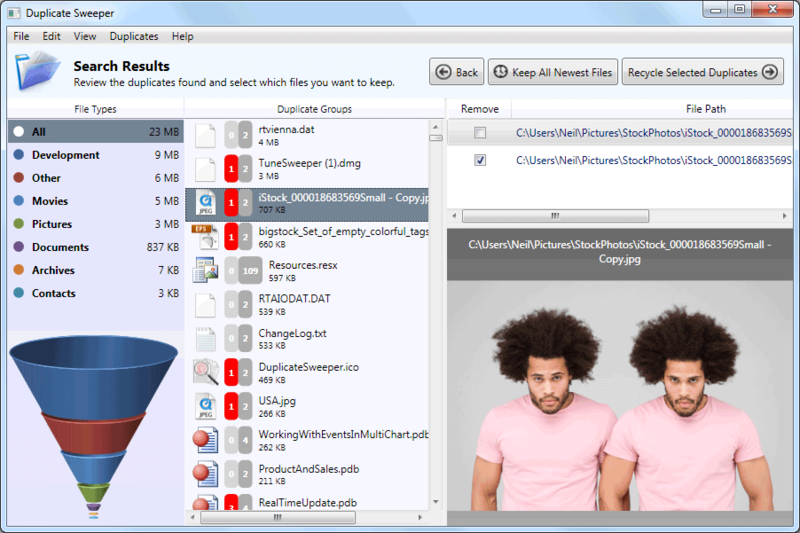 The demonstration version of Duplicate Sweeper will search and display your duplicate files. Full version is required for Duplicate Sweeper to remove any duplicate files it finds. The full version of the software will run indefinitely and you will also be given free software updates as these become available. Any restrictions are removed when the demo is registered. See the Duplicate Sweeper Terms and Conditions for more information.